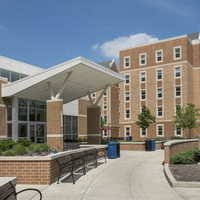 New Residence Hall is a 1000-bed residence hall complex, featuring two residential buildings where students live in small group clusters of 12. Cluster living arrangements offer enhanced privacy, where every bedroom is a single. New Residence Hall offers semi-private restrooms shared with one other student. There is a common space for each group of 12 residents that includes a study area, living room area, and kitchen-like area. New Residence Hall also features a large community center with a food court style dining area, a recreation facility, and a wireless lounge/gaming area. Establishment of new residency hall is a very good decision from people of community get best place for events. Best essay writing service hiring from https://www.thebestessayservice.com/ here is easy game for people of hall.